“Wollie” Wolmarans returns one last time for more cross-examination with Nel, who says this won’t take long. He just needs to cover a few things. Nel confirms that Wollie has made available (as requested) his photos from the November 8, 2013, investigation at the crime scene. Wollie would like to clear up that there may have been some miscommunication about what “file” meant on Friday. He does actually have a file for the case with some notes in it, even though he testified last week that he didn’t. But he is again careful not to commit to having done any full reports; he only compiled notes as his investigation continued. It’s really the same thing that he was discussing on Friday. Nel asks, when he was at the scene on November 8th, did anybody give him a version from Oscar? Wollie answers, “not that I can remember.” After a pause, he then admits that he was given the bail application and he read through that. Nel wants to know how Wollie knew where Oscar was standing during the shots. Wollie says that he used Mangena’s report to reconstruct the scene. He also believes that it was mentioned in the bail application, but Nel corrects him that Oscar did not go in to detail where he was standing in that document. Nel also wants to know if he agrees with Mangena that Oscar was on his stumps and in the normal firing position which would indicate the angle and trajectory of the bullets. This is important because it goes to Oscar aiming at his target. With his arm stretched out in normal position, he likely has line of sight to his target. Wollie will only agree that shot B had sight alignment, but he’s not sure about shots A, C and D.
Nel asks, but it’s possible? Wollie agrees that it’s possible but he’s not sure. Nel is able to establish with Wollie that if the laser stays in its original position after testing hole B, and you then try to get it through holes A, C and D, you cannot do it. Wollie agrees. The importance of this is to prove that Oscar moved positions while shooting. 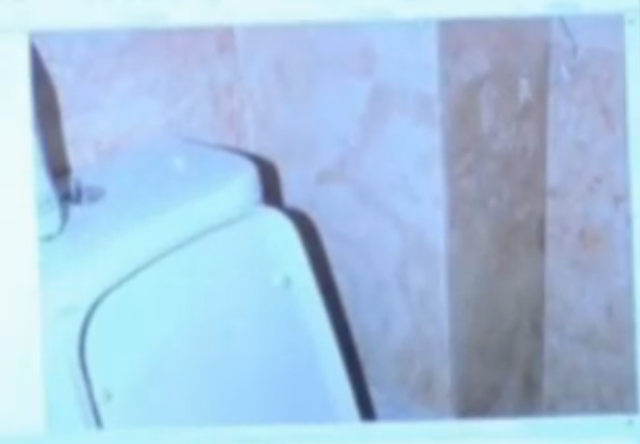 One could make the inference that he moved because he was changing aim as Reeva is moving inside the toilet room. Nel says, as far as the splinters are concerned, he would like him to look at a photograph. Nel points out that there is a splinter of wood on top of the toilet’s water tank area. It’s not visible to my eyes on the TV monitor but Wollie sees it and agrees there is a splinter there. 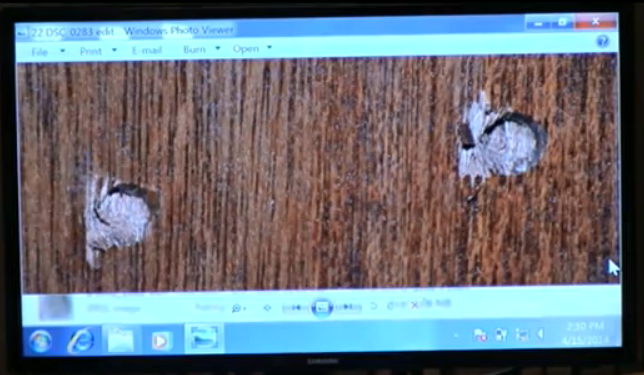 Nel says that this is where the splinter landed after a bullet went through the door. Wollie says it could also be from a blow from the cricket bat on the door, but he concedes that in all likelihood it is probably from a shot. This indicates that a splinter could travel that far from the door. Wollie can’t disagree with him. Nel then revisits the re-testing of the gun at the firing range. He wants to know why they went back to re-test. Wollie states that he believes he has answered this before, but the first firearm used was in his opinion not friendly with that type of ammunition and he couldn’t fire it in rapid succession. He was only able to shoot one bullet at a time and then had to reload manually. So the gun itself worked, it just couldn’t fire in rapid succession using the type of bullets they were trying to fire. Nel asks, is that the only reason you went back to re-test, or could it also have been because of background noise? Wollie claims it was only because of the issue with the gun. It had nothing to do with background noise. Nel wants to know why they waited so long to go back and re-test. The first test was on March 21, 2014, and the second test was on April 9, 2014. That is 18 days. Why not go the next night? Wollie first states that he can’t say for sure why, but then goes on to say that this is not the only case he is involved with. He is busy. Nel wants to know why they didn’t re-test the bat sounds on April 9th, since cricket/frog sounds were heard clearly in the background. Wollie says he doesn’t hear them due to his hearing condition, but other people had told him that the background noises were indeed there. So Nel says, since everybody was aware of these noises, to ensure that both tests had the same background noise, why not just repeat both tests on April 9th? Wollie says that the door was already broken to pieces and they didn’t have another one to use. Also, he’s not a sound expert. He didn’t think it would make any difference. He doesn’t see the necessity of it. Nel then shows him the following photo which Wollie has seen before. Nel moves on to the back wound and the striations. The one aspect that they agree on is that the magazine rack would not have caused striations due to it being a smooth surface. In addition, the pattern of the striations on the abrasion are very “regular”. Wood grain is not a regular pattern. To me, this is far more indicative of the striations being from the shirt. If the bullet had enough energy to create that injury, I would think that the energy or heat from that could have pressed that pattern on to the skin while the shirt was between the bullet and the skin. 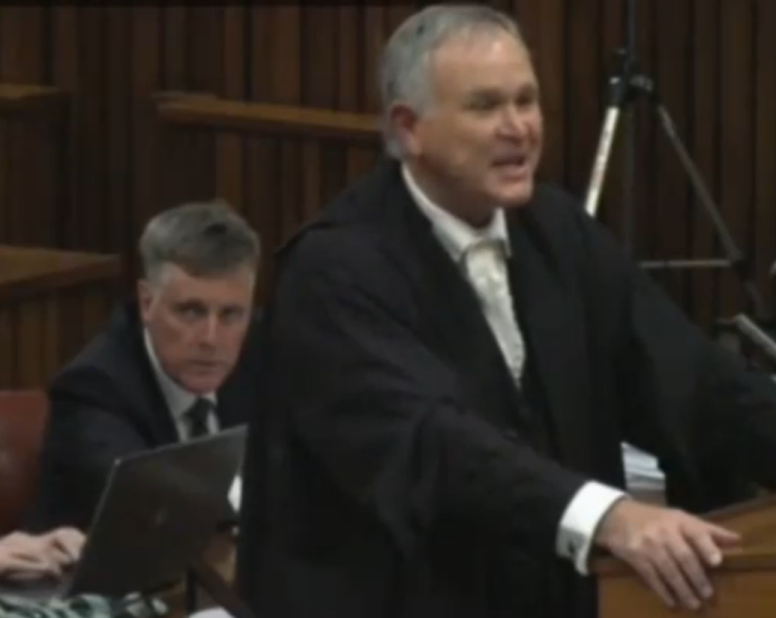 Nel points out to Wollie that he is contradicting evidence from Professor Botha, the defense pathologist. Botha testified that he concluded that the striations were caused by the magazine rack. Wollie does not agree with Botha, but expresses very high respect for both Professor Botha and Professor Saayman. Wollie also says that he does not believe Professor Botha is a toolmark examiner (and Wollie is). Nel now addresses the fact that Wollie and Dixon met with each other a few times after Dixon’s testimony. Nel wants to refresh Wollie’s memory on those meetings. He asks Wollie if he remembers having dinner with him at Jocks Restaurant. He does remember this meeting but states it was informal. He remembers that he wanted a pork chop but they didn’t have any so they both had t-bone steaks. Nel tells him, “that’s impressive that you remember that since the meeting took place on March 26, 2014.” Wollie doesn’t dispute it nor does he dispute that they discussed the case. Conveniently, he can’t remember the content of what they discussed when asked by Nel. Selective memory in court is always fascinating to me. •Nel wants to know, after his investigation on November 8th, was Wollie content that bullet A hit Reeva in the hip. Wollie says he’s still content with that finding. Nel says the question is different. 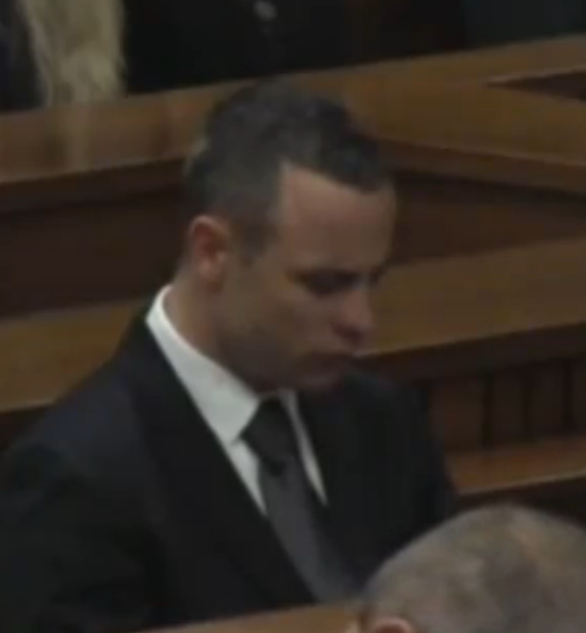 He wants to know if he was happy on that specific day with the finding that bullet A hit Reeva in the hip. Wollie answers, yes. 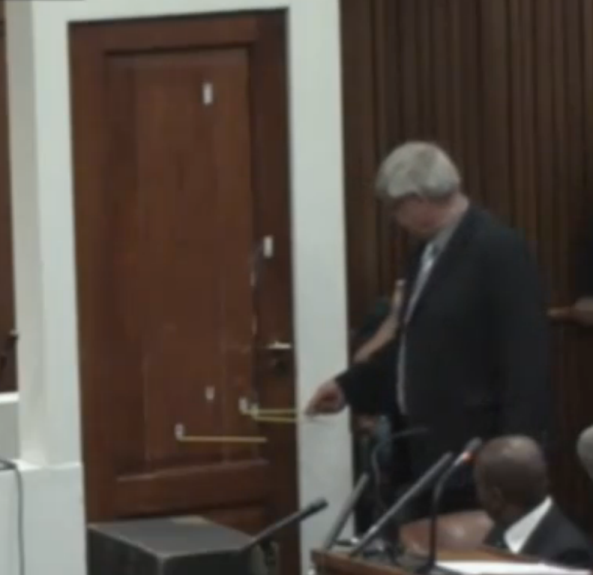 •Nel also establishes that Wollie is in agreement that Reeva was standing upright in front of the door at the time. Wollie adds that she may have been bent slightly but yes, she was standing upright in front of the door. 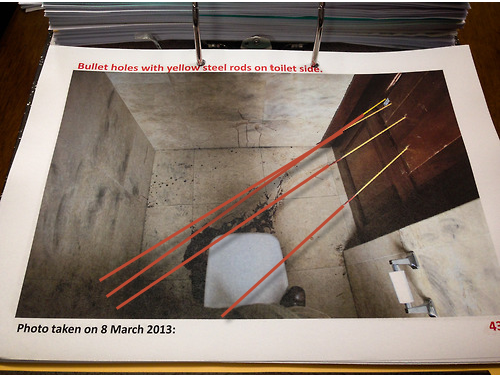 •Wollie says at this stage of his investigation, on November 8th, he did not have a finding on which injuries were caused by the other bullet holes. The only one that he can clearly remember they established was bullet A hitting the hip. •Nel also points out that based on his testimony from Friday, Wollie agrees that Mangena was able to get the laser to mark E on the wall by going through hole B, with no deflection. 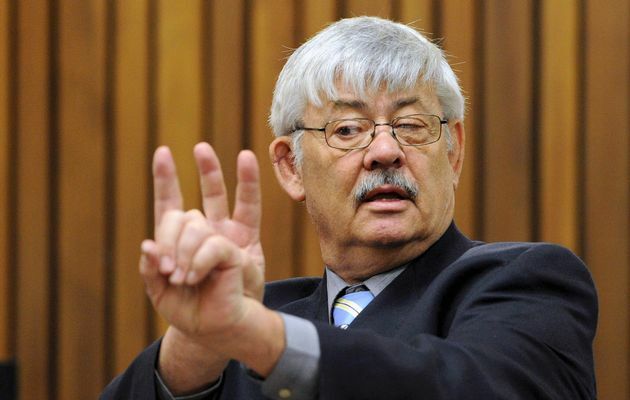 And if there was no deflection, then bullet B missed Reeva. Wollie again agrees that this is possible. •Nel says, in order for B to miss her, she must have fallen somewhere before that shot was fired because otherwise that shot would have hit her. Wollie agrees, she must have fallen with her right hip completely destroyed but he’s clearly trying to be careful about directly conceding here. I believe he can see where Nel is going with this. But again, some period of time must have to pass in order for Reeva to change position (fall) and shot B to totally miss her. I don’t see how A and B could be rapid succession considering her body movement. And let’s not forget, there are ear witnesses to support the pause after the first shot. That only strengthens Mangena’s findings here. •Nel says we can exclude that she fell flat to the floor because then she would be too low for the arm and the head wound if she’s flat on the floor. Wollie agrees, he does not believe she collapsed straight down. •They move on to holes C and D. They establish that the height of hole C is 99.4cm. And the height of hole D is 97.3cm. Nel says that based on those heights, it would not be possible for Reeva to be sitting flat on the floor when those shots hit her. She would be too low. Wollie says that she may have been hit when falling down, but he has to concede with Nel that if she was sitting flat on the floor, or in a stationary position when the C and D shots were fired, then she would not have been hit. •To further support his point above, Nel says that with Reeva’s hip injury, she would not have been able to be on her haunches. Wollie agrees. In other words, she would not be able to support her own weight; she would have needed to be sitting on something. They all agree that she was not sitting on the toilet. So the only other “something” in that toilet room was the magazine rack. Wollie agrees with all of this. Nel ultimately asks, doesn’t it make sense that she was sitting on the magazine rack for the remainder of the shots? Wollie says he does not think that she would be able to sit because of the hip injury. Nel says, she’s not supporting her own weight, she’s basically propped up on the rack and her head/upper body is leaning over. Nel asks, doesn’t this make sense? Wollie doesn’t understand. Nel tries to explain it to him again but he won’t concede, he just says he’s not sure. I found this illustration online that gives a clear depiction of the position that Nel is referring to. Nel then embarks on an exchange with Wollie about the magazine rack and where it was positioned for Wollie’s reconstruction done on November 8th. By this date, Wollie would have seen the police photos and known where the rack was when originally found. But again, Wollie is confusing the point and trying to act as if he didn’t know exactly where it was supposed to be at that time. Nel says to him this is very concerning because the magazine rack position was an integral part of Mangena’s findings and Mangena’s report had been available to him by that time. Wollie answers back that he also had Saayman’s report and Saayman indicated that one potential cause of the back injuries was contact with a hard surface, so he was working along those lines at first. To me, his point seemed more like an excuse than a genuine explanation. I get the impression that because the rack is very problematic for the defense (it supports everything that I outlined above), they did not want it to be where it actually was at the time of the shooting and played around with the position during their investigation. And that would be exactly why Oscar lied about the magazine rack on the stand! On the surface, it seemed really silly for Oscar to be lying about that, but when you fully understand the significance of the rack’s position, it then makes sense. Nel says to Wollie, in fairness to him, he sees in his report that he was testing what Saayman said about the hard surface, but why would he not also test the magazine rack conclusion that Mangena had given because that forms the basis of his conclusion? Wollie just says he only concentrated on that one point from Saayman, plus he isn’t really sure that the magazine rack really mattered. Also, he had very limited time at the scene to conduct his investigation. Don’t let Wollie fool you… he’s trying to brush this off, but the Defense does understand the significance of this rack and they do not want to concede to Mangena’s findings. Hopefully the court is paying attention on the points that Nel made today. Nel then asks if he conducted any other sound tests at the scene. He says no, not myself. And Nel is about to continue on when Wollie says he may have just told a lie and grins a bit. There was one other test that he wants to mention for completeness sake… The day that they asked him to hang the door, he stood outside the toilet room and shouted to somebody standing outside in front of the house. He shouted his name (Christo) three times and asked him if he heard it. The window and the toilet door were open at the time. Then he stood inside the toilet room and closed the door and shouted Christo’s name again three times, and Christo said he couldn’t hear him. He reminds the court that he is not a sound expert. Nel asks, when was this? Wollie says it was very shortly before March 3, 2014, right before the start of trial. He was present along with Christo and the artisans who helped to hang the door. And FRANK was there too. Our mysterious gardener buddy Frank Chizweni pops up again! He was there to open the door for them. Christo is a friend of Wollie’s who is an artisan and he asked him if he could assist him with the door, due to the disability with his back. Nel asks if this was done during the day. He says yes. Nel asks him why he did this; did anybody ask him to do it? Wollie says that nobody asked him to do it, he just did it. Nel asks Wollie why he was at the scene that day. He says that the legal team asked him to go to the house and take a door from the foyer leading to the garage, which is exactly the same shape and size as the toilet door, and hang it upstairs in the bathroom. He doesn’t know why. He also says he’s not an artisan, so he got some help. He says he still doesn’t know why they had him do that. Nel asks if there were any other instances that he went back to the scene that had to do with the bathroom/toilet. Wollie says there was one more time that he and Dixon went back to the scene but he can’t remember the date. Nel says he’s not asking about that instance. That was the visit at night when they went to test the lighting conditions in the bedroom. Wollie says he can’t remember any other time. He’s been there a few other times, but can’t remember dates. Nel wants to know if Wollie went back to the scene at night any other time. He says yes, one other time, but can’t remember the date. It was about 3-4 weeks ago, while the trial was in process. It was because of Mr. Dixon testifying on visibility. The legal team asked him to go put on the balcony light to see what he could see. It was only he and Frank there that night. Again, Frank opened the door for him. It only took him 15-20 minutes. So overall, even though Wollie was seemingly reluctant to give details, Nel established that Wollie was at the crime scene quite a bit over the past year and there was some additional testing that the State didn’t know about. Nel looks at Wollie’s CV and states that he left SAPS in 1992, and asks if it’s correct that he’s been practicing as an independent consultant ever since. Wollie confirms this is correct. Nel wants to know if he has done any proficiency tests during this time. He says no, it’s not required for independent consultants. He wants to know what this is from but Wollie does not know. He is not familiar with the photo. Nel rests and Roux is up for reexamination. Roux addresses Mangena’s report and asks Wollie if anywhere in the report there is mention of Mangena testing holes A, C and D to see if they match up with mark E, taking deflection in to account. Wollie says, no. Roux then asks about the bullet fragment hitting the back. Wollie states that in order for the fragment to end up in the toilet, it would have to make a U-turn after hitting the spot on the back. After hitting the spot, it would likely lose all of its energy. So he is still standing firm that the fragment could not hit the back and end up in the toilet. He thinks if it hit the back, it would be more likely to fall on the floor and the fragments under the magazine rack don’t match the injury. Roux then addresses that the back injuries go in an upward pattern. 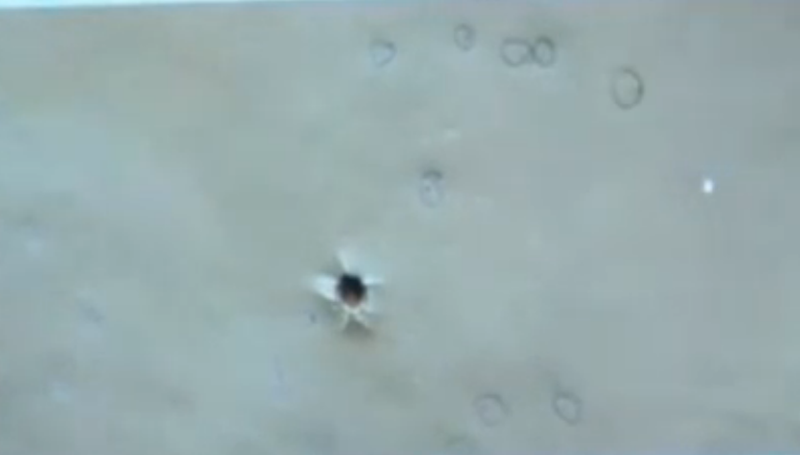 He asks, how could the bullet fragment go from F to the bottom of the back and then upwards? Wollie says it would have to bounce off the back twice and then go up… it’s just not possible. Roux wants to know about the accuracy of probes; can they move in various directions? Wollie walks over to the door and wiggles the probes and shows that there is movement upwards, downwards and sideways. Roux asks, “when somebody fires four shots, would you expect them to be from the same exact position?” Wollie says, no. With recoil, your hand will never be in the same position. Roux wants to know what Wollie meant about “sight alignment”. He answers that when he is at the shooting range, shooting at a target, there are certain principles to follow. The firearm has a back side and a front side. The back side has a V-shape and the front side has a pin. He demonstrates with his hands. He then aligns his eye with the back side, front side and the target. They must all be lined up to hit the target correctly. Looking at the holes, he would not say that Oscar shot with sight alignment. Wollie concludes his reexamination by saying that if the court wishes, he can have the shooting range and door set up again so that the court can go there to experience the sound tests in person. He thinks this will be the best way for them to experience it. Roux rests, Wollie is excused. The next witness is Dr. Merryll Vorster. She is a registered forensic psychiatrist. She reads the introduction from the report that she has compiled for court. She states that Oscar was evaluated to determine his present mental condition and any psychiatric factors that may have been present at the time of the alleged offense. Interviews were also conducted with family members, colleagues and friends to obtain collateral information. •A report from Richard Holmes dated February 18, 2014. •Medical records from Milpark Hospital dated February 21, 2009. •Affidavits from Justin Devaris, Samantha Greyvenstein and Graham Binge (cousin). •And then the people that she interviewed for collateral information: Diana Binge (aunt), Aimee (sister), Peet Van Zyl (manager), Alex Pilakoutas (friend), Carl (brother), and Ampie Louw (coach). The developmental history: Oscar is the middle of 3 children, born with a congenital abnormality resulting in the amputation of both legs below the knee at the age of 11 months. This surgery was performed pre-language level. Oscar would not have understood why he was in the hospital. Vorster explains that there would have been pain with this surgery, and since he was pre-language he would not have been able to be comforted by his mother. It would be perceived by the young child as a traumatic assault. He was fitted with his limbs and able to walk by the age of 17 months. He was never restricted from participating in physical activity and was raised to be normal. Vorster says this is significant because he was never able to allow himself to be seen as disabled. To me this seems like a double-edged sword. One would think it would be a positive thing that the mother raised him to be a (for lack of better word) normal person but the doctor seems to imply that it had the opposite effect. Vorster says that over time, this could result in increasing levels of anxiety. Oscar described his mom as being very loving. His father was often away. At 6 years old, his parents divorced and there were drastic changes in his social circumstances. His mom started working and his father had financial problems and didn’t always support them. The father was described as irresponsible and mostly absent according to all siblings. From the collateral information obtained, his mother was an anxious person who abused alcohol intermittently. She slept with a gun under her pillow. There were frequent times that police had to be called to their home to investigate because of her fears. The siblings all grew up with issues of anxiety because their mother never adequately comforted their fears, she added to them. I was really disappointed to hear the doctor testify about the mother. In everything I had previously read about her, she was described as being very loving and supportive, and that Oscar was very close to her. Now in court, while he’s trying to blame anxiety on his bad behavior, they are seemingly throwing her under the bus saying she had alcohol issues and gave them anxiety. Of course, I have no way of knowing what is true, but the poor lady is dead and this just feels wrong. This type of testimony drives me nuts. In general, it’s just a sob story about every sad thing that ever happened in the accused person’s life. Everybody has tragedy and adversity, some worse than others. When people try to use it as an excuse for killing another person, it really makes me cringe. Prior to the shooting, I would imagine that the last thing that Oscar ever wanted was to be seen as emotionally or mentally challenged. Everything about his public persona was quite the opposite. Now that he’s on trial for killing a person, he is all of a sudden going to pull out psychological challenges as an excuse. Speaking bluntly, I find it insulting and malingering at its finest. The report continues, Carl was often tasked with looking after his two siblings. The paternal grandmother supported the family financially. Oscar was a sociable child; he did well in school and in sports. He was occasionally teased and his brother would have to intervene. Vorster believes that in being sociable he was concealing his feelings about being disabled. At age 14, Oscar moved to Pretoria to attend high school. He lived with his father and saw his mother on weekends. Within a few months of living at his father’s, there were problems at home so he became a weekly border at school. On weekends, he would go to his mother’s and his aunt’s/uncle’s homes. Carl attended the same school as a boarder as well. Aimee continued to live with the mother. Oscar played many sports. At age 15, Oscar’s mother died suddenly. He was significantly traumatized by her death, increasing his anxiety levels. He describes this period of his life as very stressful which was confirmed by his siblings and his aunt. After his mother’s death, he continued to be a weekly boarder at school and stayed with his aunt and friends on weekends. He had support from his extended family and friends, but had infrequent contact with his father. His relationship with his siblings was very close, but he had no primary attachment to a parental figure at this point in his life. At age 16, Oscar sustained a knee injury playing rugby. As part of his rehab, he started running. He obtained a coach, started training and that lead to competitive running. By grade 11, in addition to his coach, he had a manager, was competing internationally was becoming financially independent. After he completed high school, he began competing as an international athlete. He had a coach, manager and various sports advisors and traveled extensively. He had few strong emotional ties. He saw extended family infrequently but saw his sister often. He described being quite lonely. At age 21, he says he broke all ties with his father following an argument. He was financially independent by this time. He spent many months during the year in Italy training. On the occasions that he came back to South Africa, he reports being anxious about the high level of violence and crime as reported by the media and as discussed within his family setting. He bought a firearm for his own protection. His aunt, Mrs. Binge, mentioned that he had a burglary in his townhouse and that resulted in him adding extensive security measures to his property. Oscar reported that as a professional athlete, he worked very hard to gain sponsorships to make a lot of money and be financially secure. Autonomy and independence was his attempt to manage his anxiety. He had a strict training regimen with focus on diet, lifestyle and training. He made sure he was always punctual and well-prepared for media events. He had few long term relationships. He was very self-sufficient. He relied on social media to stay in contact with friends and siblings. Vorster then says it is her opinion that Oscar has an anxiety disorder. People that have this disorder work hard to control their environment and be very prepared in order to alleviate their levels of anxiety. His strict training and diet helped him to alleviate his anxiety, but as he became exposed to being more famous and having media attention, he would have to prepare more and more to not embarrass himself in any way. Having order in your life helps to alleviate stress from anxiety. Past medical history: Bilateral below knee amputations at 11 months old. On-going stump pathology treated intermittently. As a child, he contracted Encephalitis and since then has had chronic headaches. In Feb 2009, he was involved in a boating accident during which he sustained facial fractures. He had a brief period of loss of consciousness and had mild concussion. He was admitted to Milpark Hospital where he had extensive facial surgery. Past psychiatric history: Oscar has many features of anxiety. There is a clear family history in his mother, sister and brother. Roux asks, what is the relevance of the family history of anxiety? Vorster says that anxiety disorders do have genetic pre-disposition. Oscar notes that he was always encouraged to appear as normal as possible, despite his disability. He became determined to participate in sport and was able to keep up with able-bodied friends in activity. He became increasingly unwilling to reveal his stumps publically and this gradually extended to family members and friends. He would keep on his prosthesis during the day, only removing them at night when he went to bed. He gradually started having feelings of inadequacy about his amputations. I would imagine to some degree or another, that all of the feelings described above would be quite normal at certain stages of life for anybody dealing with amputations or disability. I don’t pretend to understand what it is like to experience this, my point only being that I’m not hearing anything that is shockingly abnormal for somebody who lives with a disability. And last I was aware; having these feelings should not be a pre-cursor to murderous activity. Roux wants to know how having a poor self-image, yet being successful (confident) on the race track are compatible. Vorster explains that due to his success on the track, he strove to always conceal his stumps and his feelings of inadequacy. By concealing his disability, it rendered him less able to access the emotional support required to manage his vulnerability and self-esteem issues. Matters were further compounded as he developed sexual relationships as he would shy away from revealing the extent of his disability. As he became more famous, his various sponsorships required him to attend media events and to do interviews. He describes that he would be anxious about these events and would spend many hours preparing so that he would not embarrass himself. He also describes feeling increasingly stressed by the demands placed on him as a professional athlete. Vorster says with increasing stress, he would have to work even harder to keep his anxiety under control. Not to sound insensitive to his issues, but average people with anxiety issues experience all of these things too. Everybody has jobs, responsibilities, families, and financial burdens that create extreme stress. In my opinion, just because you are famous, does not necessarily make your anxiety any more prolific or important. If anything, Oscar would have the financial resources and close personal advisors available to help him manage what he needed. Most every day people do not have access to that. If he really had an anxiety disorder and chose not to seek any help from anybody for his entire life, then he has to take responsibility for not treating his issue much earlier. To only reveal it now in court when it may be viewed as an advantage for you, is a bit disingenuous and that is why I tend not to fully believe it. He may very well have some anxiety, but I do not believe it caused what happened on February 14. Everybody has an opinion about this trial, as they should. And I’ve noticed that those who seem to be on the side of not guilty are on that side only because they believe that the violence in SA coupled with Oscar’s anxiety are absolutely believable, end of story… despite all of the other evidence. I do not dispute that violence exists frequently in SA nor do I dispute that Oscar may have some anxiety. I would think for anybody with his life story and circumstances, some anxiety would be fairly typical. BUT, I cannot ignore the totality of the evidence presented in this case. You can’t put the perceived intruder + anxiety story in one bucket, and the physical/circumstantial evidence + ear witnesses + common sense in another bucket. They cannot be separated. The totality of the evidence always tells the story. And the reason that we have this psychiatrist on the stand, days before the defense is due to rest, is because the defense team has hit the end of their road. Trust me, if psychological issues were at the heart of this case, it would have been dealt with LONG ago. Do not let your heart strings cloud your common sense in this matter. Vorster goes on to say that while Oscar was training in Italy, he would feel lonely, but his fears about personal safety were fewer. He followed SA news closely and worried about his siblings’ safety, in particular his sister’s safety. Vorster states that as one becomes more anxious, their fear of personal safety increases, even when their safety may not really be threatened. While in SA, Oscar describes having increased anxiety over safety, he was worried about being followed and worried about the safety of his home. He moved in to an estate believing that it would be safer for him there, but subsequently there were break-ins there as well. Now keep in mind, these are all things that Oscar has relayed to the doctor. He can tell her anything he wants without having to completely substantiate it. But we all know that in court, the defense was not able to substantiate their claims of multiple break-ins and crimes against Oscar personally. Oscar and a friend (Stander) saying that crimes happened versus the police reading actual police reports is not much of a match. It is not a coincidence that the police do not have reports of what Oscar claims happened to him. Oscar couldn’t even remember who he called to pick him up on the night he was supposedly shot at on the highway. She goes on to say that he tried to increase the security at his house, and his routine was to sleep with his bedroom door locked. He describes being hyper-vigilant and having sleep disturbances, waking often if there was a noise. He believed that being famous put him at increased risk. He didn’t like to be home alone and always tried to invite friends to visit and sleep over. He describes feeling generally isolated and alone, although he made friends easily. He did not share his private feelings with his friends and is a guarded and mistrustful type of person. Habits: Oscar does not generally drink alcohol during his training and competitive periods, but describes drinking excessively at times during the off season in which he may become intoxicated. He does not smoke or take drugs. History of the incident: Oscar relates that he believed he heard an intruder. He became scared and had escalating levels of anxiety. During his description of the events, the following emotions were observed – distressed, crying and retching. He stated that he had no intention of shooting Ms. Steenkamp and he feels devastated that he killed his girlfriend. Roux asks, in her profession, what is her opinion about the emotions that she observed? In her opinion she believes they were genuine, primarily because of what she witnessed with the retching. When feigning retching, one would develop a hoarse voice, redness in the face, perhaps some tears but what Oscar showed was a pallor (he became pale) and started sweating profusely. That cannot be feigned. That is a real manifestation of anxiety. This is why she believes that his distress was genuine. I’m sure we all agree though that he was genuinely distressed. He just killed somebody and was charged with murder. Anybody would be distressed! That does not equal being remorseful or sad about Reeva dying. Mental state evaluation: Oscar presented as a well-groomed, well-spoken and polite man. He was clearly anxious as could be seen by his tremor and from the way he perspired heavily during the interview. He had no speech difficulties or thought disorder. He was fully orientated. He gave a very detailed account of himself. His mood was markedly depressed and his affect flat (few expressions on his face). Vorster states that a flat affect is a typical feature of a depressed person. Oscar is on treatment for depression. His memory and concentration were good and he had no cognitive deficits (no intellectual incapacity). Vorster goes on to say that depression can have a negative effect on memory and concentration. In this instance, she did not find any deficit on memory and concentration. Therefore, there shouldn’t be any reason why he can’t remember his call with Baba, his call to Netcare, his call with Justin Devaris, him carrying Reeva across the upstairs hallway to the stairs, etc. He has no problems talking about himself (as Vorster stated above) but conveniently forgets some incriminating parts of February 14. This goes to my point above about not just believing his intruder story and ignoring the facts of the case. You cannot ignore these very significant details. There is a reason why on the stand he suddenly could not remember those phone calls and it’s not anxiety. It’s because they do not support his story! During their examination, Oscar was asked to remove his prosthesis. He was clearly embarrassed but complied. She observed him walking on his stumps. She says his balance was poor and he could easily be pushed over. His physical vulnerability was immediately apparent. Vorster says that Oscar frequently expressed his guilt of having caused Ms. Steenkamp’s death. General anxiety disorder is pervasive, as opposed to having anxiety over specific things. The depressive disorder is secondary to the shooting. She did not find any evidence that he was depressed prior to the shooting. Discussion: Oscar has a long history of GAD which appears to have increased with time. It is likely to have commenced at the age of 11 months. His anxiety increased after his parents divorced. His mother’s anxiety heightened his and his siblings’ anxiety. After his mother’s death, Oscar lost his primary attachment figure. Although close with extended family members, he does not have a secure attachment to them. One way to alleviate anxiety is to become very controlling about one’s environment. His anxiety increased commensurate with his increasing levels of public fame. A further factor increasing his anxiety was crime in SA. He had increased security measures at his home, more so than most people in SA. The injuries he sustained from the boating accident in 2009 added to his levels of stress. He became aware that his life could change radically if he were to be injured, and that increased his personal sense of vulnerability. He could lose his ability to be an athlete, which in turn would mean he would lose his income and his independence. A further factor that may be of relevance is the incident with Mr. Batchelor in December 2012. He was concerned that Mr. Batchelor and his friends posed an on-going physical threat to him. These feelings of anxiety are confirmed by Peet Van Zyl, Aimee and Carl. These factors were all operating during the incident and would have been compounded by Oscar’s physical vulnerability and the additional pressure of perceiving his environment as hostile and unsafe. When exposed with a threat, Oscar is more likely to respond with a fight response rather than flight, as his physical capacity for flight is limited. In Dr. Vorster’s opinion, Oscar’s reaction to the perceived threat on February 14, should be considered in the light of his physical vulnerability and his co-morbid diagnosis of GAD. She would like the court to take in to consideration the following – operating at the time of the offense would have been Oscar’s physical vulnerability and secondly, his pervasive GAD which was present for many years, and would have been present on the day of the offense. She states that he is remorseful about the events and feels guilty that he has caused Ms. Steenkamp’s death and has developed a depressive disorder as a consequence of this. 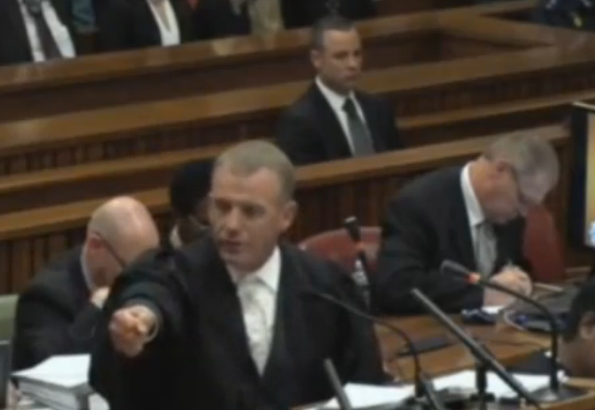 Roux rests and Nel is up for cross-examination. 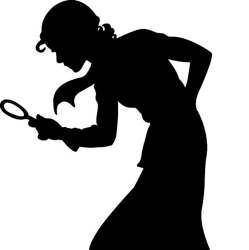 Nel wants to know from Dr. Vorster, the fact that she diagnosed Oscar with GAD and that he had it at the time of the incident, did that affect his ability to distinguish right from wrong? She answers, no, not at all. Nel asks, did it affect his ability to act in accordance with right and wrong? Vorster says, she is not saying that. Nel asks if Oscar had diminished responsibility at the time? Vorster answers that what she is trying to say is that the court should take in to account these factors and it’s really up to the court to determine if he had diminished capacity. She says that what she is really trying to express is that Oscar is different from other offenders and from the normal person because he has a physical vulnerability and GAD, so his reaction to situations would be different. Wow. If it becomes acceptable for people to use disability and anxiety as an excuse for murderous behavior, then we are certainly going to have a lot more murders on our hands. This is a dangerous path she is taking! She then says, “I’m not saying that this constitutes a mental illness.” Nel says, I don’t understand why we are hearing this evidence now. He says, “if we are not dealing with a mental illness and not dealing with a direct contribute, then why are we dealing with this evidence now?” She doesn’t know the answer to the question. Of course, Roux called her as a witness, all she can do is come and testify. But Nel can only deal with the issue through her, so he is putting it to the court… why are we hearing all of this right now? And of course we already know the answer… because the Defense is desperate. Nel tells the doctor, if you say there is a possibility of diminished responsibility, then he has to be referred today for mental observation in terms of the provision with Section 78. Vorster says, “that could be something the court could consider.” But what she is rather saying is that his reaction to situations would be different based on his GAD and his vulnerability. Nel says, taking that all in to account, it could have diminished his responsibility at the time. A referral is what would determine that. Nel says to the doctor that he is aware she has spent many years doing this type of evaluation at hospitals. She confirms that she has and also understands the provisions of Section 78. If it is alleged at criminal proceedings that the accused is by reason of mental illness or mental defect or for any other reason not criminally responsible for the offense charged, or if it appears to the court at criminal proceedings that the accused might for such a reason not be so responsible, the court shall in the case of an allegation or appearance of mental illness or mental defect, and may, in any other case, direct that the matter be enquired into and be reported on in accordance with the provisions of section 79. Nel says, you have diagnosed a mental illness, GAD, am I right? Vorster says that GAD is a psychiatric diagnosis, but she would not consider it to be a mental illness as perceived in the criminal procedure act. In her opinion, it should not be taken in to account in terms of his responsibility. She only wanted to present the GAD as a possible reason for the way he reacted. So I’m right back to where Nel was… why are we even talking about this? It either played a role in his actions that night or it didn’t. Nel says, but if the GAD is severe, it will affect your mental capacity? She says that if it were severe enough where one started to become paranoid about individuals or threats, then one may consider it as a mental illness. But GAD is not an uncommon psychiatric diagnosis. There are many people who have GAD. It affects social and occupational function but it doesn’t imply that one has lost touch with reality or can’t see right from wrong. She was called by the Defense and she linked this GAD to the incident and that is what Section 78 deals with, linking a disorder to an incident. The court is then left no option but to refer. Roux objects. He says it must be linked to mental disorder. Nel wants to know if she is categorically saying that GAD is not a mental disorder. She answers that it is a psychiatric diagnosis. Nel asks her, what is the difference? She says mental disorders affect one’s capacity to see right from wrong, and act in accordance. She doesn’t believe that an anxiety disorder limits capacity unless there are psychotic elements, which she doesn’t believe that Oscar suffers from. 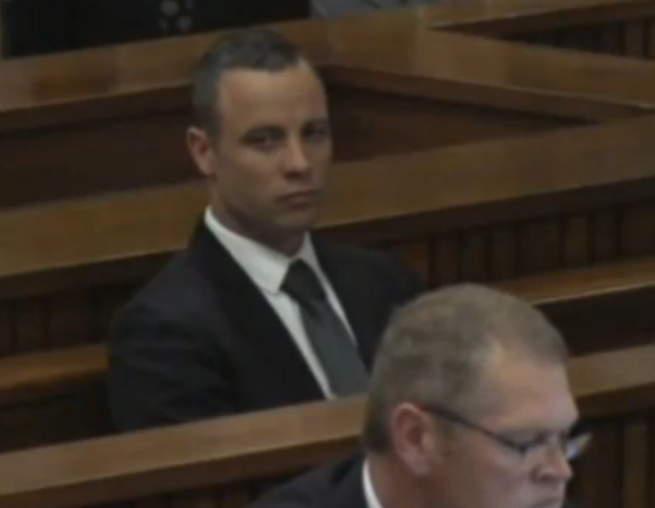 Oscar went from looking sad with his head hanging low during direct examination, to looking pissed at this cross-examination. Now that an evaluation is on the table, Vorster seems to be back-peddling a little bit to get out of this jam. Nel states that Oscar’s defense is that he thought there was an intruder in his house and that he was under attack that night. If the Defense is going to introduce evidence that Oscar has a diagnosed anxiety diagnosis, and his supposed heightened fears and hyper-vigilance played a role in his actions that night, then it certainly is relevant for the court to have him examined per Section 78. Vorster says that the diagnosed GAD is relevant for the facts of the case, so it would be up to the court to decide if it constitutes a mental illness or if the accused should be referred or not. 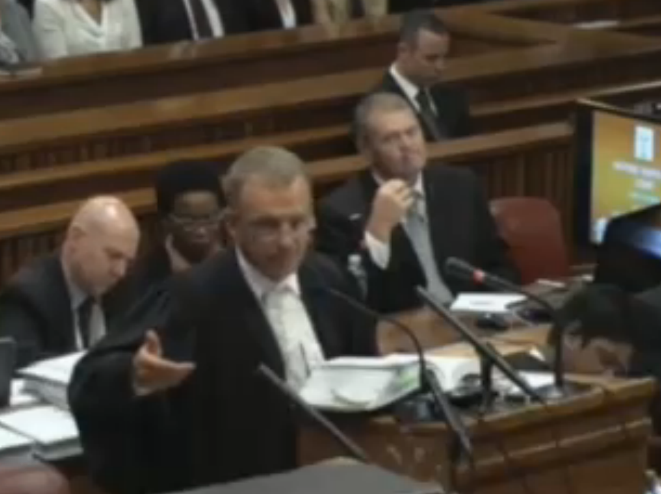 Nel asks for an adjournment to review documents as he may bring an application. They break for an hour. When they return, Nel asks the doctor if it is correct that the first interview she had with Oscar was on May 2, 2014 (that would be 10 days ago). She acknowledges that it was, and that it was after Oscar and other witnesses testified. Nel wants to know if she followed the trial at all. She says, not daily, just parts of it in the media. Nel asks her, if I put it to you that it was reported that Oscar was not a good witness, and some of the expert witnesses were not good either, do you think that would increase his anxiety? She says, I don’t know. Nel says… if he believed his case wasn’t going well, and now he has to see a psychiatrist, wouldn’t that have made him anxious. Vorster says she does not know how he perceives his case. Nel points out to the doctor that at one point during cross-examination, Oscar expressed that he was fighting for his life. Vorster acknowledges that she heard about that statement. Nel states, so in his interview with you, he is fighting for his life. Vorster says that he did not say that to her. Nel asks Vorster, what is the purpose of your report? She says to bring psychiatric factors to the court’s attention that may be of relevance for the purpose of conviction, and if required, of sentencing. Nel states, these are factors that may have affected his capacity to act appropriately at the time. She agrees. In terms of his defense, it is directly relevant. Nel asks, his anxiety disorder is worsening? She says, yes. Nel asks, for somebody suffering with a general anxiety disorder, for them to possess guns, does that make them a dangerous person in society? Vorster answers, yes!! Nel asks if people with PTSD are typically referred for observation, and she says that’s correct. Vorster acknowledges that PTSD and GAD are related disorders. Vorster seems to agree with Nel that having him evaluated would not be a bad thing because then the court could have another opinion. Not so sure the Defense agrees with that. Nel says, the court really doesn’t have an option in this matter. They have to follow the law. Roux objects and says that the accused has to have both a mental defect and lacked the capacity to act in accordance with right and wrong, and that is not her evidence. Nel and Roux embark on a pretty fascinating legal argument to determine if this application for evaluation is valid. Roux seems pretty hell bent on objecting to this. Nel asks a few more questions to Vorster which seem to solidify his application and he states his intentions to formally bring the application forward. Per the terms of Section 78, he states that Oscar should be observed and evaluated at a mental institution for 30 days. Nel presents some relevant case law to the Judge. He also throws in a dig at the Defense saying this is the 3rd defense that they have now presented for Oscar (first was putative self-defense, second was accident, and now third is GAD). He asks for the witness to be provisionally excused after he asks her a few last questions. Judge agrees and allows him to proceed. Nel asks the doctor if someone who killed their partner while in the midst of anger could have deep remorse immediately afterwards. She says, yes. Nel states that they both (meaning Nel and Vorster) have dealt with these matters in court before, and they have seen immediate remorse before. She agrees. He asks her to consider only normal people, not psychopaths, and doesn’t she usually expect normal people to have deep remorse after they’ve done something like this. She says, yes. Nel states that it’s interesting how she phrased her last sentence in her report. “He’s certainly remorseful about the events. “ He asks, what does that mean? She says he feels remorse about having caused the death of Ms. Steenkamp. Nel asks, did he ever say to you I’m so sorry I killed her? She says, no, she does not have a recollection that he said that. But she doesn’t believe that how he phrased it has psychiatric relevance. Nel asks, if somebody had a defense that they acted “automatically” (without thought), wouldn’t you then look for events leading up to the shooting and after the shooting, and if planning is observed along the way, then shouldn’t you discredit that they acted automatically?” She says, yes, there’s no question in her mind that this is not a defense of insane automatism, there was no evidence of amnesia and his reaction after the death is appropriate. This was an important point to establish. We all know that Oscar wants to claim that he just pulled the trigger without any thought process, but the doctor is saying that there is no evidence to support that he would have acted in such a way that he wouldn’t be responsible for his actions. In other words, he knew what he was doing! Nel goes through Oscar’s version: He thought there was an intruder, he armed himself and he approached the danger to sort the danger out. The doctor says, yes. Nel says to Vorster, having lots of experience in these types of matters, when Oscar armed himself, he at least saw the possibility that he might have to shoot because otherwise why would he arm himself and approach the danger, am I right? She says, “he must have (seen the possibility).” And we know that he did end up shooting. Nel tells her then she must agree with Dolus Eventualis (where a perpetrator foresees consequences other than those directly desired as a possibility). By Oscar intentionally arming himself and going toward the danger, he may not have wanted to kill someone, but he could foresee the possibility and acted anyway. And he did kill that person. However, if the Judge rejects Dolus Directus (that Oscar knew it was Reeva), the State has also been setting up Dolus Eventualis, where Oscar acted in such a way that he foresaw he could kill a person. Even though he didn’t have direct intent to kill, he took actions that he knew could potentially kill. Essentially, recklessness. I don’t see how the Judge could reject Dolus Eventualis. 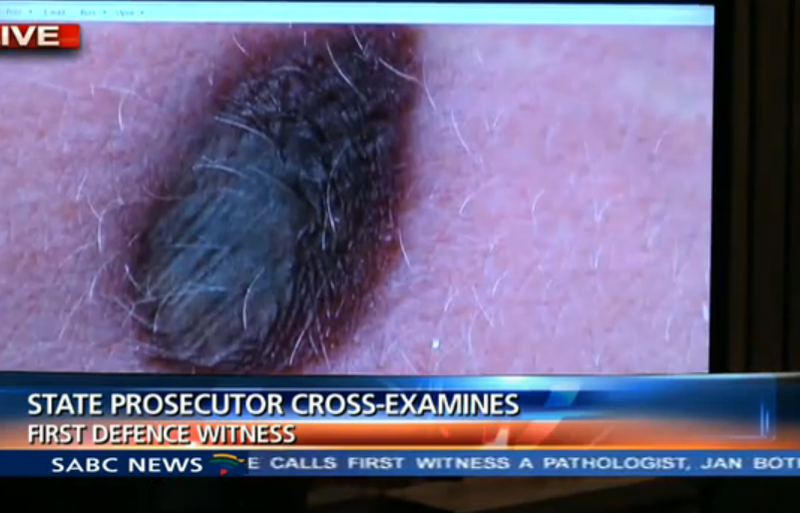 Nel has proven it through many witnesses in this case, and just did it again with Dr. Vorster. I cannot possibly fathom how they would let him walk on this. Nel wants to address Vorster’s observation that Oscar is more likely to fight then flee. Nel says, so we have a person with GAD that has a fight response, and doesn’t this make him even more of a danger because he gets anxious quickly and he approaches danger and wants to fight? She says that is not her evidence. She says that his desire to fight is really only because he has limited ability to flee because of his disability. Nel says, but Oscar armed himself and walked 5 meters on his stumps towards the danger. He entered the bathroom and walked another 2 meters on his stumps towards the danger. In actuality, it would have been much easier for him and Reeva to flee out the bedroom door instead of walking that distance. Nel asks, is this how an anxious person acts? She says, yes, some do approach danger. She states, he couldn’t run away, he’s not really mobile on his stumps. Nel says, but you did state that somebody with GAD plus a gun is a danger, and she still agrees with that statement. Nel asks Dr. Vorster what documents or witnesses she had available to her to establish Oscar’s version of events. She says she did not have access to the court docket, the bail application, or witnesses. She only relied on her interviews with Oscar and she did have available to her a report by Dr. Richard Holmes. 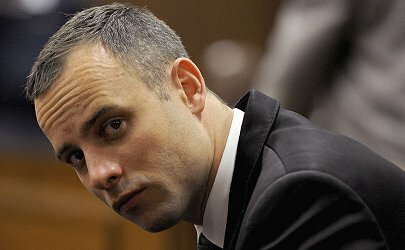 Nel asks if the state of Oscar’s case, his evidence, or the multiple versions he has presented, ever came up during their interviews. She says, no. Nel asks, he wanted to shoot an intruder? Dr. Vorster says, yes, that’s what he told me. Nel also asks, his deep remorse is because it wasn’t an intruder that he shot, but because it was Reeva? Dr. Vorster says, yes. Nel asks to adjourn, provisionally excuse Dr. Vorster, and he will bring the application forward. If the case is referred (meaning Oscar gets sent for evaluation), then that’s the end of the evidence with Vorster. But if it’s not referred, then he might continue with her. The Judge agrees. But Roux objects, you can’t deprive me of the right to reexamine the witness. He doesn’t want to argue this point in front of her so the Judge asks the witness to wait outside. While Roux is adamantly arguing his point against this application, Brian Webber looks like he’s having a baby behind Roux. Somebody might need to refer him; I think he has GAD too. 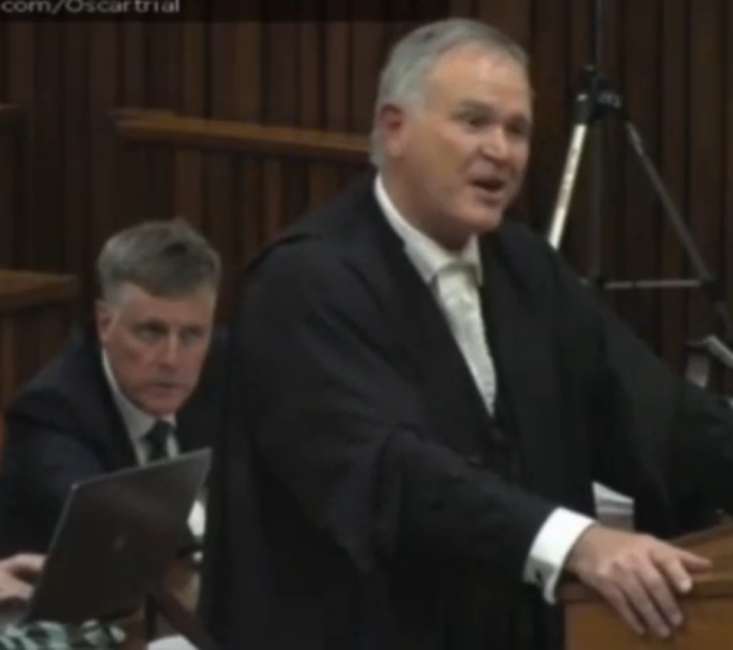 Roux wants Nel to first finish his cross-examination, so he can then reexamine, and then Nel can bring forth the application (which they will object to). They go back and forth on this for a while and then take a ten minute break so Nel can consider what he wants to do. When they come back, he asks to adjourn for the day. Vorster will return tomorrow. And all this GAD is only relevant if one believes the intruder story. The States witnesses have proved that there was no intruder, there was an argument which ended in a fight which culminated in flight by reeva into the toilet room, chased by OP with a gun. He thought about where he was going to place his shots ( 3hit her! ), he also made sure he didn’t fire a warning shot into the tiled shower in case it ricochets and hits HIM. As you say Juror13, the defence is desperate. I am sure the judge also sees this, she is playing along, because she has to appear unbiased. She doesn’t want to have all this BS play out again on appeal. Thanks again Juror13 for all you hard work, especially the difficult job of interpreting Wollie,s evidence. Thank you also for your brilliant work, great read and on-the-point observations and insights, I perceive a lot of sitations the same way and see new aspects, thanks again. GAD is just subterfudge for the ‘intruder’-story, using the SA-‘Angst’ as a twisted tool for reaching plausibility. Look forward to upcoming reports!